Can cities cope with rampant growth? About 3.3 billion people — half of Earth's inhabitants — live in cities, and the number is expected to hit 5 billion within 20 years. 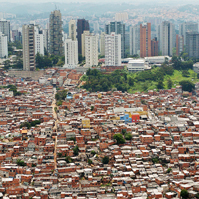 Most urban growth today is occurring in developing countries, where about a billion people live in city slums. Delivering services to crowded cities has become increasingly difficult, especially in the world's 19 “megacities” — those with more than 10 million residents. Moreover, most of the largest cities are in coastal areas, where they are vulnerable to flooding caused by climate change. Many governments are striving to improve city life by expanding services, reducing environmental damage and providing more jobs for the poor, but some still use heavy-handed clean-up policies like slum clearance. Researchers say urbanization helps reduce global poverty because new urbanites earn more than they could in their villages. The global recession could reverse that trend, however, as many unemployed city dwellers return to rural areas. But most experts expect rapid urbanization to resume once the economic storm has passed.